This review gives us a big thumb's up! Heerlike avontuur maak a lekker lees. 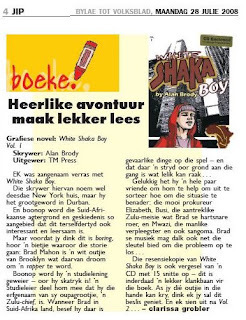 I was really taken by White Shaka Boy. The author lives in New York but he grew up in Durban. The history behind the book is so interesting it is worth reading it for that alone. But before you think it is boring listen to how the story goes: Brad Mahon is a white guy from Brooklyn who dreams of being a rapper. Before he can become a student he discovers he is filthy rich. The college admissions tell him that his great-great grandfather was a Zulu chief. When he gets to South Africa things turn out to be pretty dangerous and the strife gets ugly. Luckily, he makes friends who help him deal with the situation: a beautiful lawyer, Busi, the attractive Zulu girl who captivates Brad, Mu his musical sidekick and Mwazi, the male nurse who is also a witch-doctor. The book comes with a great accompanying music CD. If you can get your hnds on it, you'll enjoy it.